Is that not the truest words you've ever read?! I joke with my husband that my guilt is worse than most people. I'm Latina, a woman, AND Catholic...do I need to say more? I am constantly apologizing or feeling guilty about something or worrying about something I did or apologizing. Um, did I say that already? Why is it that I'm always sorry? Sorry for what?! I know I'm not the only woman out there that feels that way. Amy Poehler has quote about it - it's a real thing, loveys! I could sit here and write that we all need to just stop already. 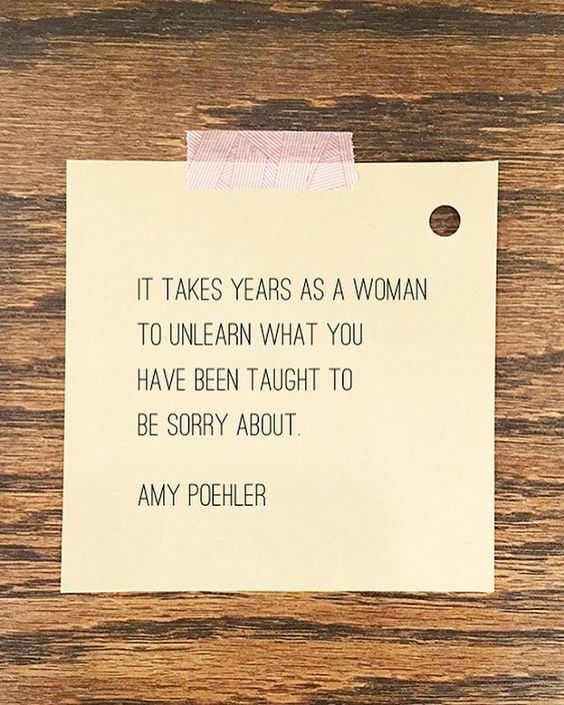 Stop apologizing. Stop feeling guilty about something we think we should feel guilty about. Stop worrying about what others will think or how they will feel about something you have done. But you know and I know...well, it's just not going to happen. Maybe this new generation - my daughter's generation - won't need to feel sorry about anything. Oh, I do hope so. But me and my girlfriends, I think we have guilt and the "I'm sorry" tattooed on our hearts and brains. I feel like there is no way of running away from it. Most of the time, I feel guilty about some really dumb stuff. Case in point: I've been sick for a few weeks. The first couple of weeks sucked, but this last week it's been getting better. My hubby (God bless him!) told me to take Nyquil a couple of nights this week. Awesome, right? What a team player that hubby of mine is! Dude! Every time Annika woke up at night, he'd just say "go back to sleep - I got her". What would I say? Yeah, you know. I'm talking every.single.time she woke up. Like, Miss Annika woke up almost every two hours the other night! Poor guy! I felt so guilty. I said sorry more than I needed to the next morning...and in every text message that was sent that day. Why? Why did I feel bad? I wasn't feeling well. He took care of business and now I'm better. But, NO...I had to apologize for being sick. Sorry you had to wake up so much. Sorry I couldn't. Sorry. Sorry. Sorry. I even annoyed myself. Does it stop me from doing it? Ugh. No. So, am I totally pathetic? Or are you, on that other side of this screen, saying, "me too!"? Don't you want to stop? I do! Okay, so how do we stop being sorry about it all? I think maybe, just maybe, every time we feel like we're going to be sorry about something that we don't need to be sorry about, we just STOP. Currently laying in bed sick. I've probably said I'm sorry over a dozen times already this morning. Sorry to my coworkers and boss for missing work again, sorry to my husband for getting me medicine, breakfast, and the kids off to school. Sorry, so sorry. I'm working on this one, but, like you said, it feels like it's tattooed on my heart. Acceptance of what is has helped me to let things just be what they are and nothing more. Acceptance that I'm okay the way I am and being able to look back on my life and see how far I've come. Thanks for your beautifully articulated post, it resonates with me and hopefully others will feel it, too.